Description: Annual to 70 cm high with main stems erect, often with branched lateral branches, ± glabrous. Leaves opposite at base of plant, alternate up the stem, opposite on fertile branches, uppermost leaves usually reddish towards base; lamina elliptic to obovate or fiddle-shaped, glabrous above, usually with a few appressed hairs below; petiole 4–12 mm long. 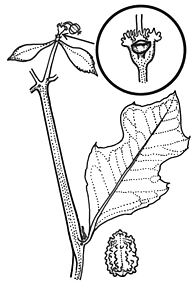 Cyathia irregularly clustered at the ends of stems and branches; involucre 2–3 mm long, gland solitary. Capsule 3–4 mm long, 5–6 mm diam., glabrous; seeds ovoid, c. 3 mm long, dark brown, tuberculate. Distribution and occurrence: On coastal sands. Native of trop. Amer.